roast | eat. drink. cook. travel. By one of those strange alignment of stars, DC and I were on overlapping business trips to Hong Kong. A bit of canny planning brought us together over the weekend at the achingly modern and very comfortable Langham Place Hotel. The only problem in getting there was that I didn’t realise that there were two “Langhams” in Kowloon, one the Langham Hotel in Tsim Sha Tsui and the other the Langham Place Hotel in Mongkok. After a bit of confusion, I finally got to the hotel and DC took me to Sham Tseng Chan Kee Roasted Goose Restaurant (深井陳記燒鵝茶餐廳). He informed me that Yung Kee was off the menu for this trip as he’d been and the standard of roast goose was abysmal compared to its price. So this place it was and we proceeded to order the roast goose noodles. 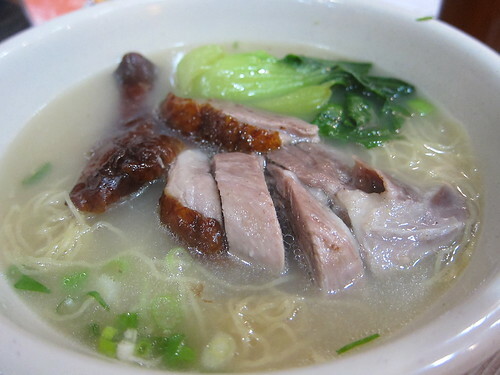 Sure, the soup was full of msg, but the noodles were firm and springy and the goose. 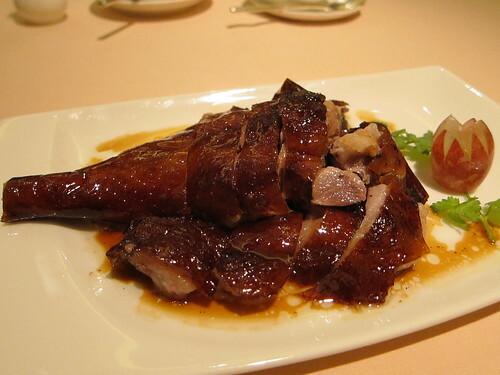 Mmm… the first piece of goose I put in my mouth was tender and flavourful. The fatty, savoury juices from the drumstick flowed beautifully with each bite. 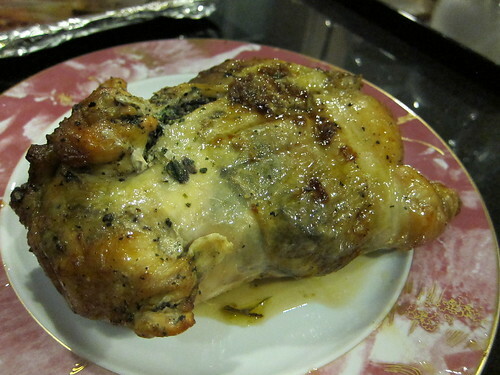 It’s a pity that not every piece of the drumstick was as tender. The skin was soggy – we couldn’t salvage it in time before it all sank into the soup. Still, for about HK$40 (S$6), this was a fantastic welcome to Hong Kong. We dithered a while on which dishes to order. Greedy as we are, we realise that our stomachs nonetheless have finite capacities (sad to say, mine more so than DC’s). 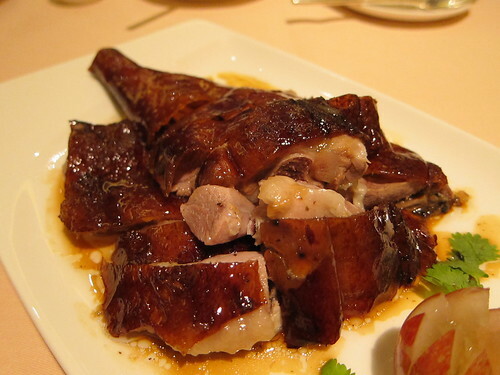 It went without saying that we would have the roast goose – chiu-chow style roasted goose (HK$148 or S$25). It’s almost a pity it came first as it was the star of the show. 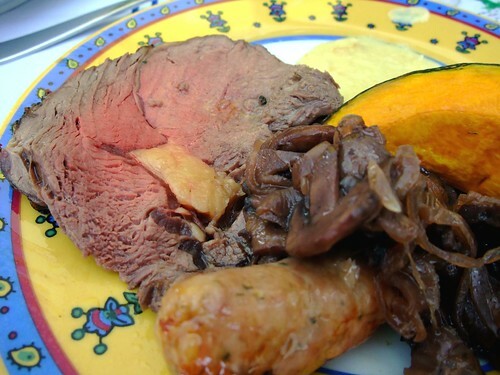 The best roast goose in our combined experience, and that’s saying something. 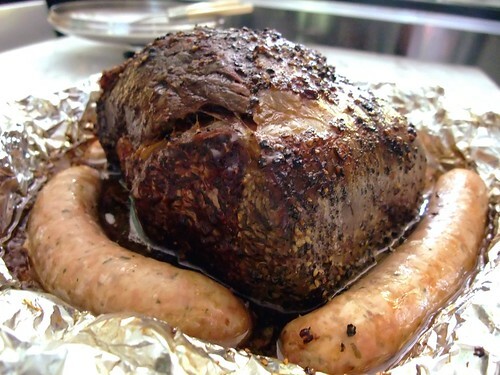 Check out how tender the meat is in the pic below. One angle not enough? Look at this pic. See how crisp the skin is? And the thin sliver of fat under the skin? It was a sublime experience as each morsel was perfectly tender. I could taste both the slightly gamey flavour of the goose and the spices of the marinade in each bite. Then there was the wonderfully crisp skin; we were so glad that we asked for the drumstick portion with a higher skin to meat ratio. And something most amazing that put this in a class of its own: the marrow was still tender. It’s hard enough to roast a bird so that the meat is tender and the skin crisp, let alone stop the marrow from drying out. This goose scores full marks in our books. The rest of the meal simply paled in comparison after the goose. The vegetables were on the soggy side. 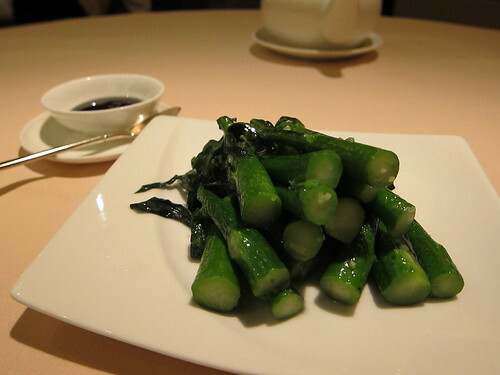 I’m not sure if vegetables in Hong Kong cook down soggier or it’s just the style of cooking. I’ve had better vegetables elsewhere. And then the lowest point of the dinner. 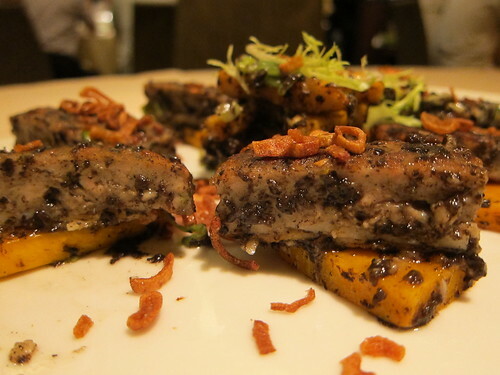 This was a gold award winning dish from 2010 – pan-fried chicken skin filled with minced chicken and black truffles, accompanied with sliced pumpkin (HK$288 or S$50). The first piece was interesting, with crisp pumpkin at the bottom and a very slight hint of black truffle in the sauce. Too bad the chicken skin wasn’t crisp as it was sandwiched between the meat and the pumpkin. My preference was to keep the skin on top to preserve the crispness for longer. There was also way too much for the two of us to work through that dish of maybe eight pieces. We really wanted to like this but it was too cloying and monotonous after the first piece. Next better player please. And a next better player did indeed step up. The signature fried rice. I hear you readers cry, “What? Fried Rice?! At a Michelin starred restaurant?” Let me explain. 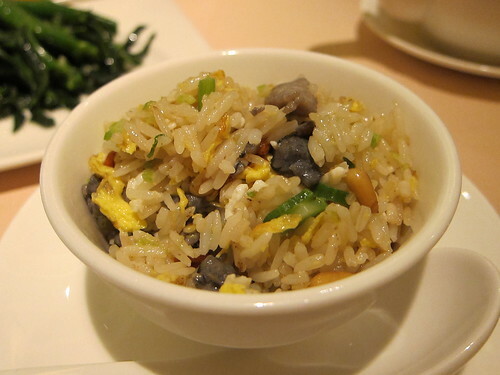 This version, fried rice with silky chicken, crispy conpoy and shao xing wine, served in a casserole (HK$198 or S$35) was made with black chicken and pine nuts, fried beautifully together, and placed in a hot claypot to accentuate the wok hei. 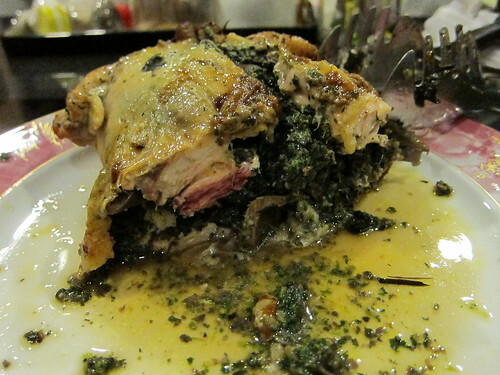 The chicken was indeed silky as mentioned in the menu description and there was plenty of smokey charred flavour. The best part was the layer of “fan jiu” (飯燋) or burnt rice at the base of the claypot. Beautiful. By the end of our dinner, I was so stuffed by the rich food that I couldn’t handle any heavy dessert. Very unwisely, we didn’t take any of our friendly waiter’s recommendations. They were mainly fried or incredibly rich, like deep fried egg fritters, birds nest soup, giant longevity bun stuffed with lotus paste and salted egg yolk. 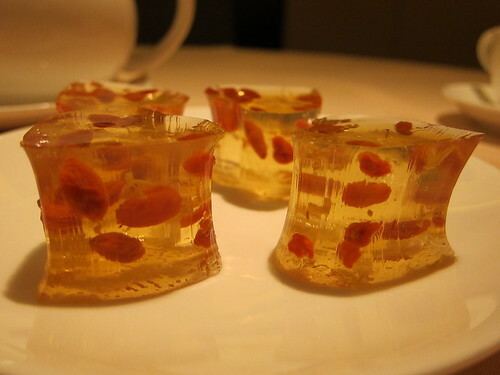 And we ordered osmanthus jelly with wolfberry. While it was very pretty, it was nonetheless a foolhardy choice as the jelly was too sweet and rather too firm for my liking. Altogether, the meal was good with a modest damage done of HK$1000 or S$160 including tip. 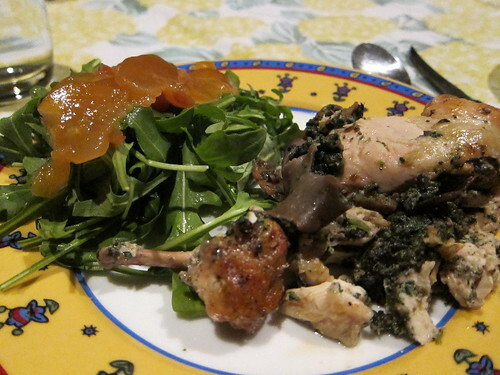 The downer was the overly oily and too monotonous chicken and pumpkin dish. We would definitely order something more classically Cantonese next time, and maybe save a bit of space for a richer dessert. And the roast goose? I’ll fly to Hong Kong just to eat that again. DC took me to Braise for our anniversary dinner. It was a lovely place with the best service I’ve experienced in Singapore: warm and attentive yet unobtrusive. They noticed that I was cold and not only gave me a shawl, they also made sure that my hot water was topped up all the time. It was too bad the tasting menu wasn’t very exciting, so we went a la carte. 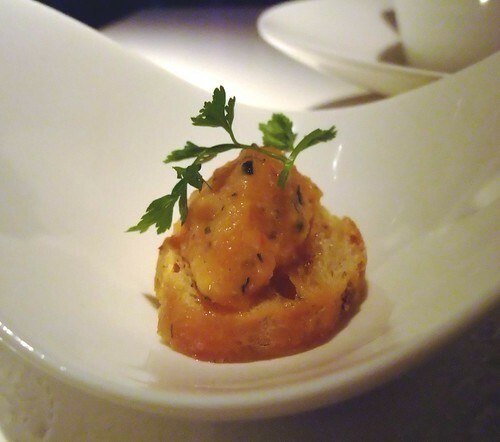 Still, the chef sent out an amuse bouche of some kind of pate on a sliver of toasted baguette. 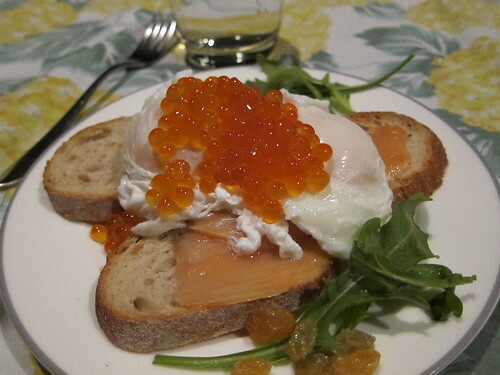 I don’t remember what it was, all I know that it was rich, very tasty and left us both wanting me. I suspect it’s a fish rillette of sorts. We’ll have to see whether it makes its way to the main menu before telling. 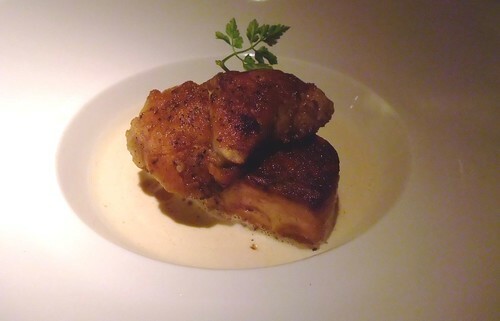 DC’s starter was just his thing: a rich and unctuous pairing of foie gras and sweetbread. I wasn’t sure of the spongey-grainy texture of the sweetbread, but DC loved it. It’s pretty difficult to get parts like pancreas in Singapore. I had half a dozen fines de claire oysters au naturel. They didn’t even need the lemon, they were so fresh. 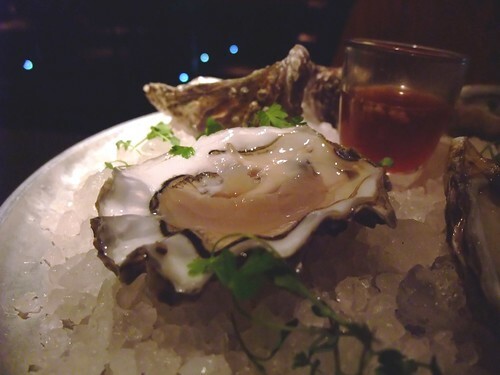 I loved how the sharp, slightly briny taste mellowed into mouth-filling savour. It was a pity they didn’t have a muscadet to go with it, that pairing is made in heaven. I was so sad when I ate my last one, enjoying the aftertaste for as long as I could. It’ll be a while before I get oysters of that quality again. Now for the mains. Mine was a straightforward roast beef in jus, paired with braised beef cheek, savoy cabbage and decadent, decadent buttery mash. It was a good dish that tasted far better than it looks in the picture. (The problem with romantic settings is that pictures just don’t come out well at all.) 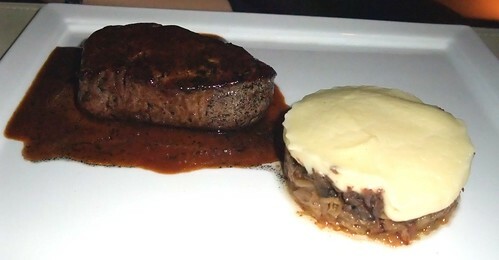 The beef was nicely rare, just as I like it, and the beef cheek the expected melt-in-mouth tender. Coupled with the very buttery mashed potato, it was a tad on the rich side, which DC quite predictably loved. Needless to say, I finished the savoy cabbage quite quickly as it was a good foil to all the butter and fat. I think DC may have had the more interesting dish. 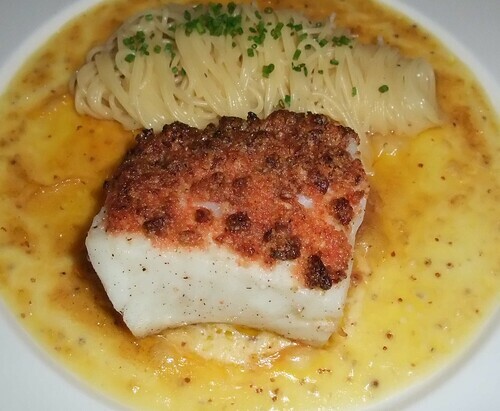 His grilled fish with capellini was quite different as fish and cheese are not commonly paired. 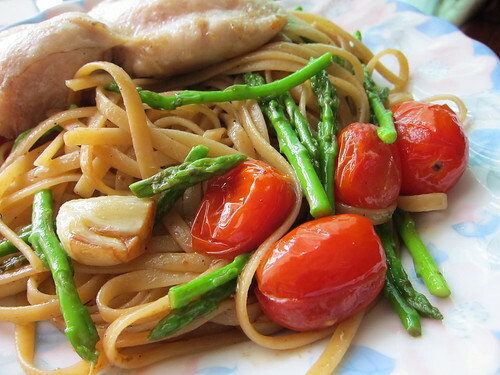 The pasta was doused in a very cheesy stock that wasn’t at all stringy. It was as if the essence of cheese had been distilled and used to flavour the pasta, without having any actual cheese in it. I can’t even imagine how they made this. The fish itself was good too, with a nice gratinated crust. It was ordinary in a good way. Dessert was a bit of a pity. I didn’t understand why they had to deconstruct a trifle. 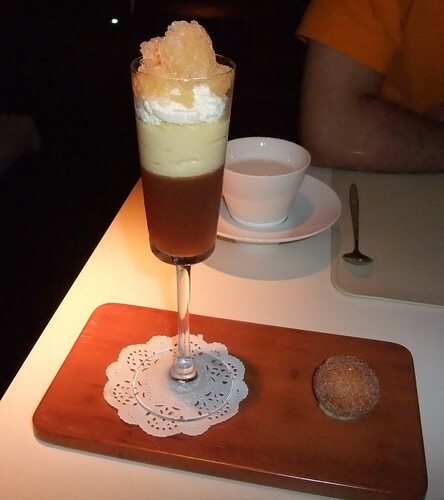 I liked the apple jelly and granite, it was just a pity that the custard was starchy. It showed that either the head chef was off-duty or hadn’t any confidence in his custard-making skills or both. I liked the cinnamon donut, but wasn’t sure of the point of it. Yes yes, I know that it’s the deconstructed trifle sponge, but it didn’t really add anything to the dessert. Braise would do better if they hired a better dessert chef. In summary, we’ve got outstanding starters and very competent, somewhat creative mains. 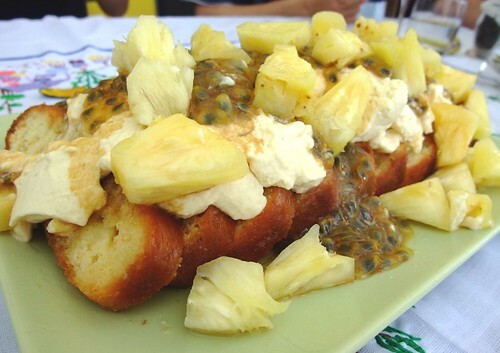 Avoid the dessert and you’ll have a fabulous dinner.